There Were Roses Lyrics And Chords By Tommy Sands. The youtube video is of myself, it's to learn you how to play the song on guitar. I use a capo on the second fret, so my version is in the key of A Major. The sheet music notes are now included. To[Em] tell you of two[D] friends of mine,who were[C] both good friends of[G] mine. And we'd often meet on the Ryan Roan and the laughter filled the air. And the[Em] tears of the[D] people[C] ran to[G]geather. We said it wont devide us we always will be one. It's little then we relized the tragedy in store. But when we heard that he was dead we could not understand. We bowed our heads and we said a prayer for the resting of his soul. Oh God it's young O'Mally,that they've taken from the door. And an eye for another eye till everyone is blind. 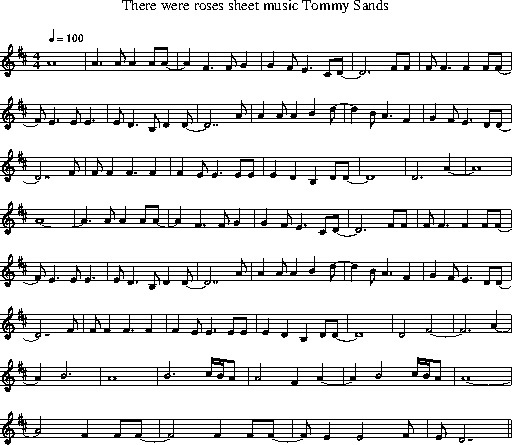 It's Bell and O'Mally and the likes of you and I.
Tommy Sands , ''There Were Roses Song'' Information the writer of this great song recalls an incident in 1974 when a Protestant friend was killed in an act of mindless violence. When the local protestant looked for a catholic to kill in retaliation they ironically chose a man who had been good friends with the original victim. It took Tommy almost ten years to write this song because he had been so close to the events,The song sums up war. Just look at what George Bush said about Iraq,We Have nothing against the Iraqi people,it's Sadam. Two weeks later 100,000 Iraqi people were dead. Anyway, a great song for your set list, always goes down well at sessions. Sheet music included.